I adapted adn idea fro them '97 CM Idea Book for the layout. I made my own template for the blocks using two 1 1/2" squares. Draw lines to create 3-D effect. I used Making Memories alphabet stickers on the blocks. I also used Mrs. Grossman toy, geometric, micro heart and micro star stickers. 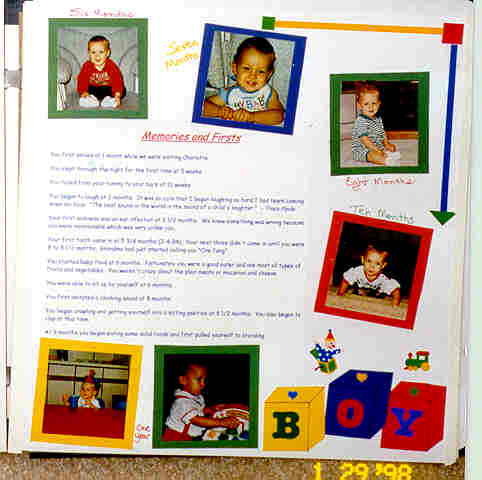 I cropped the pictures to about the same size then mattem them on paper to match the blocks. I used the gometric stickers to guide the viewer around the page chronologically.